Purpose: To evaluate the morphology of apical portion of impacted maxillary canines and their effects on root resorption of adjacent teeth as well as their locations and inclinations with cone beam computed tomography (CBCT) in an individual group of orthodontic patients. Materials and Methods: In this descriptive cross-sectional study, 71 diagnostically difficult impacted canines of 55 orthodontic patients were studied with CBCT images. In this group, the orthodontic treatment approaches for eruption of their impacted teeth were not successful. A radiologist opined about the angulation, the position of apical and coronal portion of maxillary canine tooth, resorption of adjacent teeth as well as existence of apical hook and root curvature in reconstructed images. The simultaneous existence of hook and root resorption with other data was subjected to statistical analysis by Chi-square and Fisher's Exact tests. Results: In this cross-sectional study, the position of crown in buccopalatal dimension were respectively 16.9, 73.2 and 9.9% in buccal, palatal and middle portion of the alveolar bone. Apical hook was seen in 28.2% of cases. Root resorption of the adjacent teeth was induced in 32.3% of the cases, 69.6% of which were slight. Overall, there were no significant statistical differences between the presence of hook, and the positions and angulations of impacted teeth. Conclusions: Apical and palatal positions of crowns of the impacted maxillary canines were the most common locations in the selected groups. The possibility of root resorption of adjacent teeth could be related to angulation of impacted tooth. Introduction: Dental infection has plagued the human kind for as long as our species has existed. It is often difficult to diagnose the stage of infection. The relative blind surgical incision and drainage performed in such situations usually results in excessive harm through unnecessary extensive incisions, and failure to locate and evacuate the abscess cavity completely. 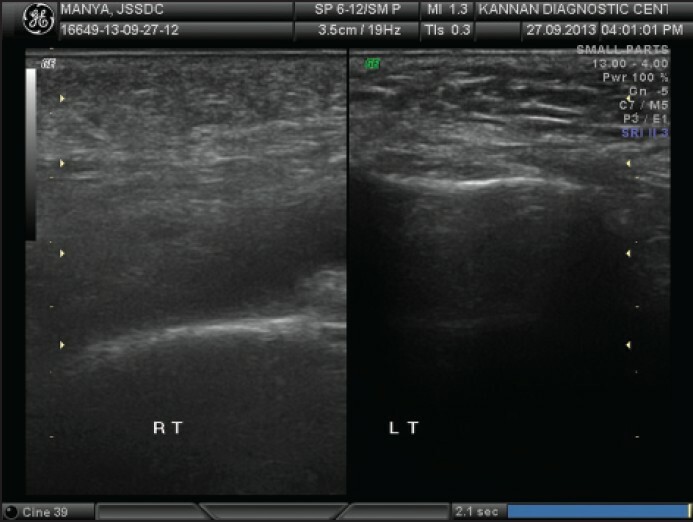 The potential use of ultrasonography (USG) in fascial space infections of odontogenic origin has not been explored completely and deserves much more intensive, high quality research. Objectives: (1) To elucidate the role of USG as an adjunctive diagnostic aid for fascial space infections of odontogenic origin. (2) To aid in appropriate treatment planning and management of fascial space infections of odontogenic origin. Materials and Methods: The study group comprised of 30 patients of either genders, irrespective of age and presented with unilateral fascial space infection of odontogenic origin. After the clinical and radiographic examinations, patients underwent USG evaluation. USG-guided intraoperative aspiration was done to confirm the diagnosis. All the findings were tabulated and subjected to statistical analysis. Results: USG was as accurate as USG-guided intraoral aspiration (Gold standard) in diagnosing fascial space infections of odontogenic origin with sensitivity and specificity of 100%. In cases of abscess USG showed a well-defined homogenous anechoic pattern, cellulitis cases showed an ill-defined heterogeneous hyperechoic pattern while edema showed an ill-defined isoechoic pattern. Conclusion: The different stages of fascial space infections of odontogenic origin can be clearly depicted on the USG. 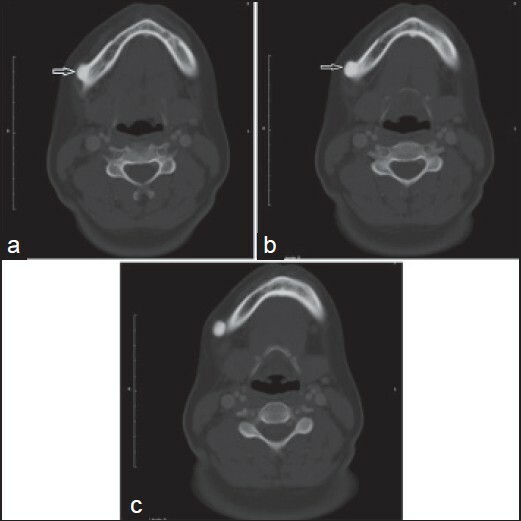 USG can be used as a reliable adjunctive imaging technique in the diagnosis of fascial space infection of odontogenic origin and thus aids in appropriate treatment planning and management of such cases. 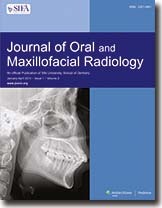 Aim: The aim of this study was to evaluate the use of lateral oblique radiography (LOR) at two different incidence angles for the bucco-lingual topographic localization of the mandibular canal with respect to the lower third molars. Materials And Method: A total of 24 dry jaws bearing at least one third molar were subject to LOR at vertical incidence angles of 0° and -30°. A trained and calibrated examiner measured the distance between the top of the mandibular canal to the most apical point of the third molar, using a digital calliper and individual light box for the radiographs. Based on the analysis of the two measurements (incidence angles of 0° and -30°) and considering the buccal object rule, the observer estimated the location of the mandibular canal, which was classified as lingual, central or buccal to the corresponding third molar. Results were compared with the computerized tomography images (gold standard). Results: The statistical analysis included sensitivity, specificity and accuracy tests. These results showed that LOR (0° e -30°) could be used to determine the bucco-lingual location of the mandibular canal with respect to the third molar. Conclusion: In spite of the magnification, LOR images demonstrated that the technique could be used for this study proposal. Objectives: Radiopacity can facilitate diagnostic observations adjacent to flowable resin composites. The aim of this study was to evaluate the radiopacity of the current low viscosity flowable resin composites and to compare them with human dental tissues. Materials and Methods: Five specimens of seven flowable light cured composite materials with a thickness of 2 mm were prepared and radiographed alongside an aluminum stepwedge, human enamel and dentin. Three standart occlusal radiographs for each material were taken with exposure time of 0.32 seconds and focus-film distance of 40 cm. Films were processed in an automatic device, and digitized using a desktop scanner. Mean gray values of the materials, stepwedge, enamel and dentine were measured using Image J software. The data were analyzed using the Duncan multiple range test. Results: The mean gray values of flowable resin composites ranged from 26.61 ± 1.45 to 38.38 ± 1.47. The radiopacity values of the materials evaluated were in decreasing order: G-aenial Flo, Filtek Ultimate Flowable, Flowline, Estelite Flow Quick, Leaddent Flow, Supraflow, Bright Light Flow. 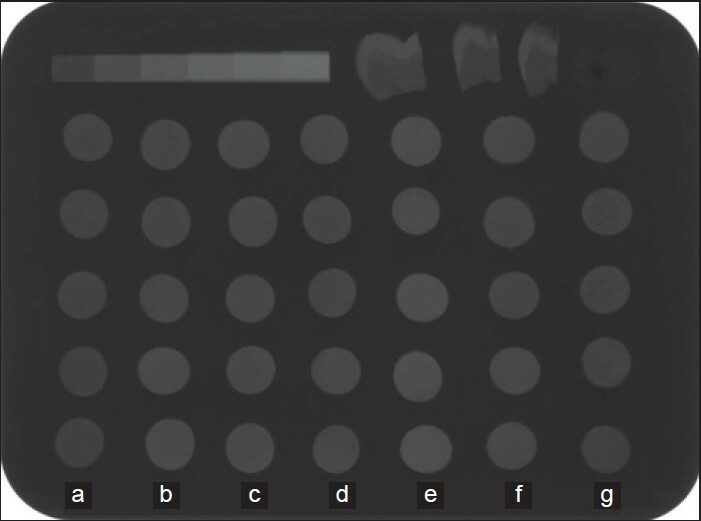 All flowable resin composites, except Bright Light Flow, demonstrated significantly greater radiopacity values than 2 mm of the aluminum scale and dentin (P < 0.05). The radiopacity of only one flowable composite, G-aenial Flo, was found to be significantly higher from enamel (P < 0.05). Conclusions: All investigated materials presented radiopacity values above the minimum recommended by the international organization for standardization. A 63-year-old male patient admitted to another hospital for prosthetic restoration. 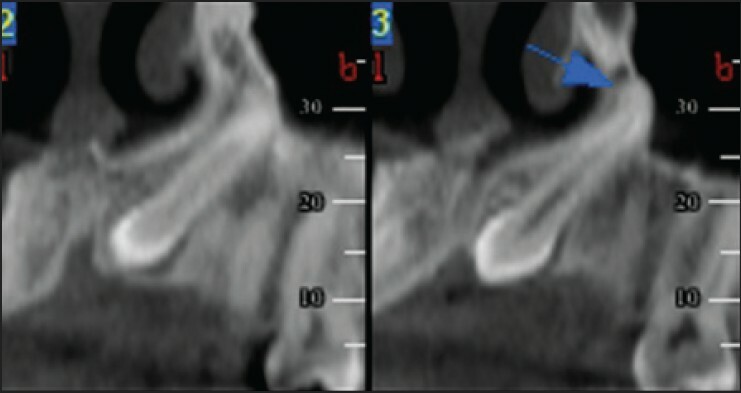 On the panoramic radiograph a lesion was detected on the right mandible and he was referred for a cone beam computed tomography (CBCT) examination. The patient then admitted to our clinic for the diagnosis of this lesion. 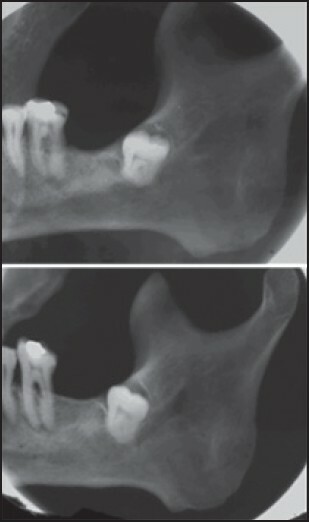 Review of the dental records revealed that a panoramic radiograph and a maxillofacial computed tomography scan were made about 10 years ago, and a Stafne bone cavity (SBC) was diagnosed. Moreover, a follow-up panoramic radiograph was made about 5 years ago. Despite the explanation given, the patient requested the CBCT examination in a private imaging center. The imaging features of the lesion were the same. In order to protect the patients from unnecessary radiation, the clinicians should make every effort to prevent duplicate imaging, and X-ray based advanced imaging techniques should be reserved for selected cases. The mandibular second premolar is highly variable developmentally. Agenesis, abnormal tooth germ position, distal inclination of the developing tooth, and impaction are among the reported developmental anomalies. Detection of pathologic lesions associated with an impacted tooth usually requires removal of the tooth and the lesion. The purpose of the present report was to describe the radiographic and histopathologic features of a case of pericoronal radiolucency associated with an impacted mandibular premolar tooth. Osteomas are benign, slow growing osteogenic tumors. They are often occurring in the craniofacial bones but rarely originates from the mandible. Osteomas have three varieties as central, peripheral and extraskeletal. Central and peripheral osteomas are often seen in the facial bones. Peripheral osteoma often located in the frontal, ethmoid and maxillary sinus, but rarely occurs in the jaws. Usually they are asymptomatic and discovered incidentally during radiological and clinical examinations. Osteomas are characterized with well-defined, rounded or oval radiopaque mass in the computed tomography. 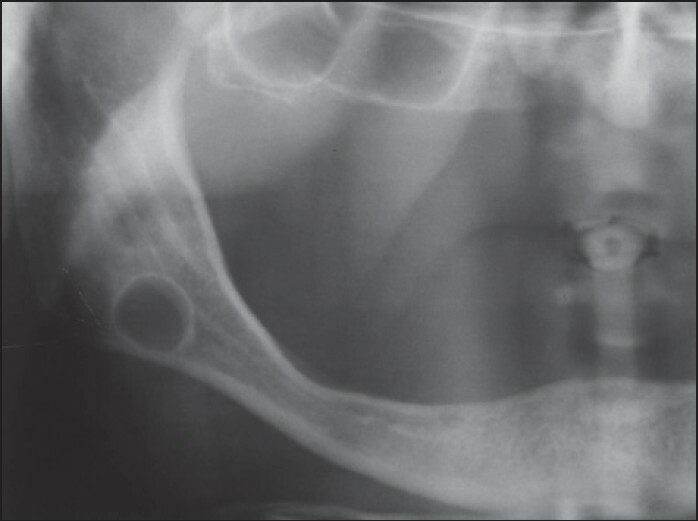 Herein, we report a rare case of peripheral osteoma of the lower part of the mandible in a 19-year-old female with radiologic and pathologic findings.